Carefree happy mother holding her beloved little daughter with intellectual disability enjoying leisure and having fun in the kitchen. 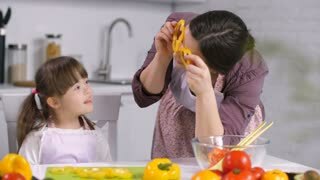 Playful mom holding whisk as microphone and singing to child. Carefree pretty young mother and daughter heavily soiled in flour fooling in the kitchen. Mom and child have fun together. Carefree young mother and daughter fooling in the kitchen. Mom and child have fun together. Carefree young mother and daughter fooling in the kitchen cooking at the kitchen table. Mom and child have fun together.